Do You Want to Build the Best Nipa Hut in the Philippines? 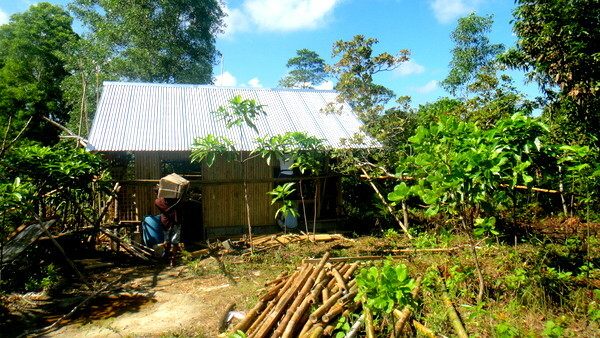 Do you want to build the best nipa hut in the Philippines or do you want to build one half-assed? The Bahay Kubo, Balay, or Nipa Hut, is a type of stilt house common to most of the Filipino rural culture. If you desire to manufacture a quality hut, you need a quality crew. Take a gander at our brother-in-law Joery in this photo. 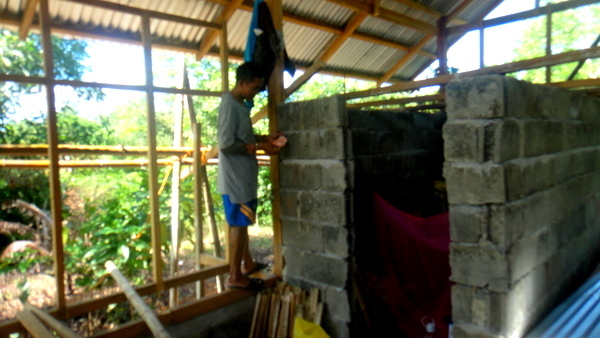 He’s preparing to put a concrete finish on the CR, Comfort Room, walls. He always does quality work. Now take a look at the concrete that Joery and crew member Gerry are mixing. We don’t have some chichi concrete mixer, the guys are doing this the old-fashioned Filipino way. 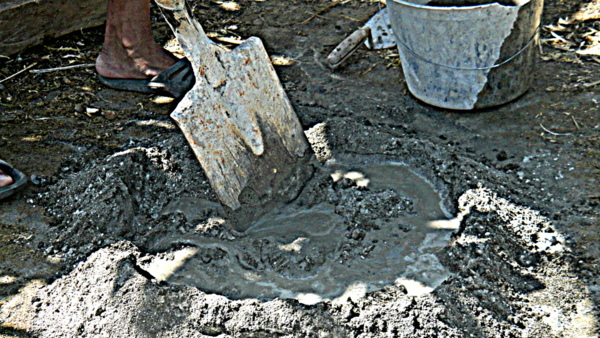 This was the concrete mixing process used in the building of our private Comfort Room over at my asawa’s home at “The Compound” five years ago. No need for expensive equipment when the traditional method works just fine. 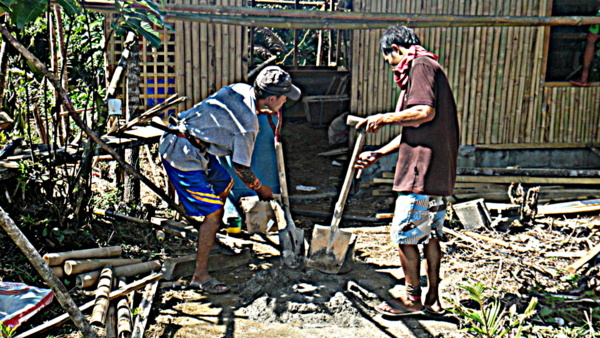 If you want to build the best nipa hut in the Philippines you don’t necessarily need to spend big bucks for your tools and machinery. In fact, native tools, like the bolo, will be one of the handiest gizmos you can have in your toolbox. 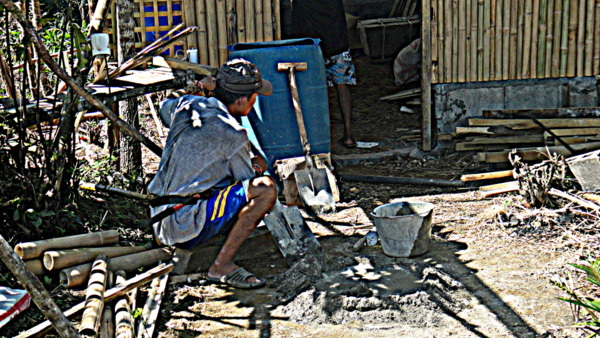 That said, when the actual construction of our new homestead begins, I might consider purchasing a portable cement mixer like the one used by construction crews at Savannah Subdivision in Iloilo depicted in the next photo. The total square meters of our new digs will total over 250. 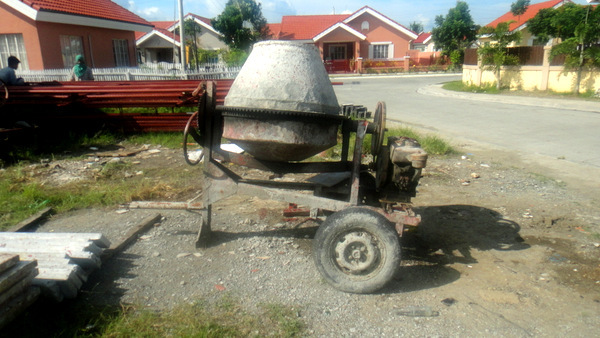 Now such a cement mixer can be rented for as little as 130 pesos a day, 3 US Dollars, or you could buy a single bagger unit ( a single bagger refers to a machine that uses one bag of concrete and is not a reference to a bad prom date) for around P35,000, approximately 800 USD. Either option would be preferable once work on the new domicile commences and should expedite the building process. Yup, that’s what the concrete mix looks like close up. It ain’t pretty, but if mixed correctly with the sand, it will do the job. 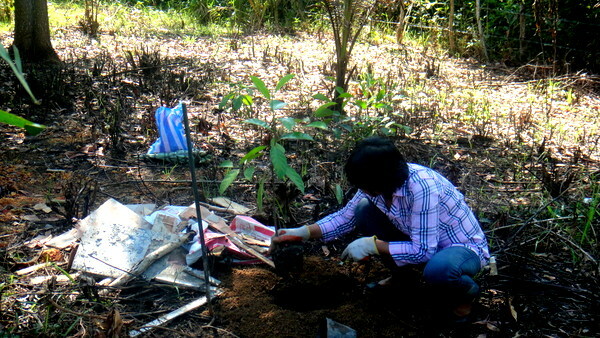 My lovely asawa, presented in the photo above, was busy planting a total five of jackfruit plants. 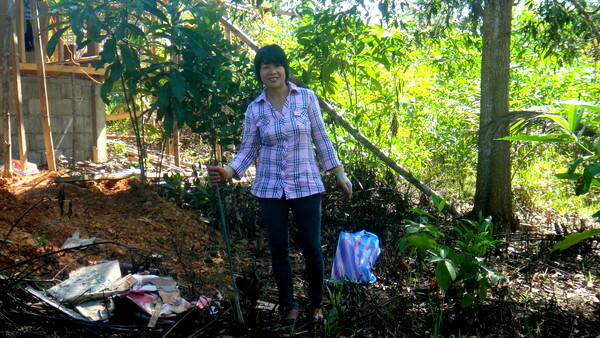 She also planted a few pineapple plants and will have lots of room to display her talented green thumb talents at our new property in the Philippines. This has absolutely nothing to do with building the best nipa hut in the Philippines, but I figured it’s always wise to include my wife in any posts that I possibly can. 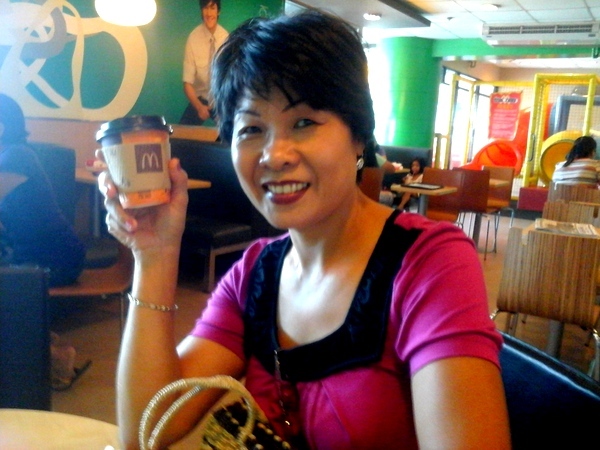 By the way, did you regular readers of Philippines Plus notice my spouse’s new hairdo seen above? She is letting her hair grow out and has abandoned (for the moment) her previous shorter look (seen below) which she has had for the past five years that we have lived in the Philippines. I was fine with this look but since it’s her hair, I figure she has the right to do with it want she wants. She asked me if the new look made her look older. I wisely answered “NO!” My diplomatic answers might be one reason we have been married almost 15 years. That and my considerable charm. OK, back to the planting. It was sweltering the day my wife planted the jackfruit but she didn’t care but note that she does wear a long-sleeved shirt to protect herself from the sun. She loves to work outside and in the past has called her plants and flowers her “babies.” Back in the States when I would roll out the lawn mower each summer, I took care not to get too close to any of her precious flowers. Of course, I did clip one of her “babies” occasionally and would make sure I ran over them several times with the lawn mower and mulched them beyond recognition. Talking about running over something, here’s a little tsismis (gossip) for you. I’ve been told that all the drivers of a major bus line in the Philippines have been instructed to back up and run over anyone that they may hit on the road to make sure the person is dead. It’s cheaper to pay for a funeral than to pay for the hospital bill. Here’s a look at the “road” that goes from the entrance of our private road to our building site. Before the rainy season hits next year we will have the entire 300 meter path lined with white rock. One of my expat friends wisely suggested putting down a base layer of rock while deliveries are being made as the weight of the delivery vehicles will help compress the rock. 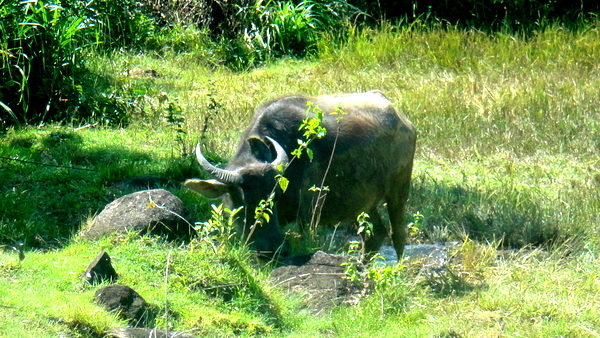 Our neighbor’s carabao was carousing around our rice field, grazing on the grass and cooling off in the water that remained from a recent rainfall courtesy of Typhoon Ruby. Again, nothing to do with building the best nipa hut in the Philippines but who doesn’t like a good carabao shot? 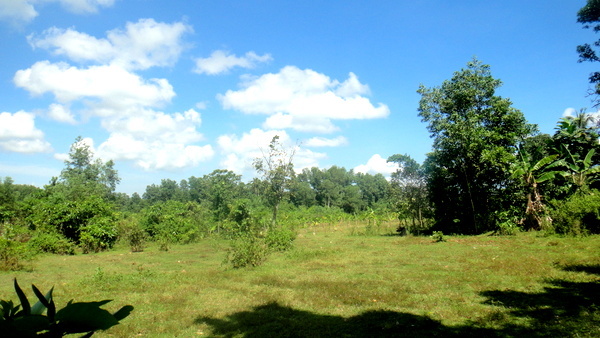 This final photo reveals a view of our new property in the Philippines from our private road. The peace and quiet in the area is a welcome respite from the noise we would sometimes encounter at “The Compound” in Guimaras or Savannah. Once our new digs are complete and my father-in-law is moved in to the nipa hut, life will once more become less stressful. There is a barangay down the road which will be celebrating their annual fiesta soon but since we will be at “The Farm” we won’t have to endure the thumping bass beats blasting over huge boom boxes that are so commonplace here. I can’t wait to make the move! ← Will Lolo’s New Nipa Hut Serve as the Temporary HQ for the Tom Cat? Your comment on the bus drivers is very true. Thanks, Derek. I sincerely appreciate your support over the years. Yeah, I was afraid that news about the bus drivers was true. Sorry to hear that. Funny you talk about bus running over someone. We took a bus to Subic yesterday, while we were stopped for some road construction and a man on a motorcycle was crossing in front of the bus and apparently the driver didn’t know he was there and started taking off. You could here the motorcycle being crunched by the bus. I thought for sure he was seriously injured or dead. Luckily I don’t think he was seriously injured as he was taken by a trike to the hospital. Anne was all upset as she saw it from the front seat. Needless to say we had to switch busses. Glad to hear the poor guy wasn’t hurt, Papa Duck. I can bet Anne was upset, that would be traumatic to witness. It’s dangerous riding a motorcycle around here. Saw two teens on a bike lay their bike down in front of me the other day. No helmets, like DILG Secretary Roxas who dumped his bike in Samar, but the kids picked up the bike and took off.